Can Baking Soda Tenderize Dry Beans? Baking soda can act as a tenderizer for dried beans. 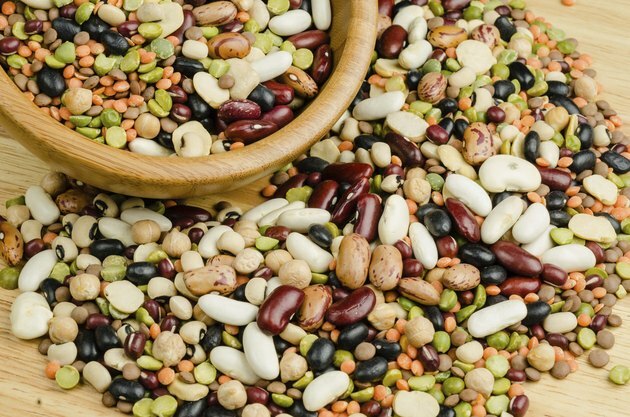 Dried beans that just won't get tender, despite following soaking and simmering directions to the minute, are typically caused by hard water, beans that are old, or beans that have been improperly stored. The next time you forget to set your dried beans to soak the night before you need them, your beans can still be tender on time if you use the standard quick soak method and a little baking soda. A dried bean has a moisture content of about 16 percent when it enters the wholesale market. As beans age, that moisture slowly seeps away, the beans gradually hardening and becoming less able to absorb moisture. This results in beans that don't soften correctly after soaking and simmering. Beans don't just lose moisture as they age, but also seal it out as age-related chemical changes and interactions take place. The pectin becoming insoluble and binding with phenolic acids to harden a bean's skin. Storing beans in conditions that allow them to dry and harden produces similar results. One way to speed up the cooking time of dried beans is to use a tenderizer, like baking soda. Hard water is high in calcium and magnesium, and increases the cooking time of dried beans by slowing and even preventing softening. Baking soda adjusts the pH level of the water, allowing the beans to soften as usual. Baking soda also helps tenderize beans by speeding the deterioration of pectin, essential to plant cell structure and strength. If you're using hard water or beans damaged by age or storage, add 1/4 teaspoon of baking soda per pound of dried beans to the soaking water. If you empty the soaking water and use fresh water to cook the beans, replace the baking soda. The tenderness that baking soda offers comes with a cost, a sacrifice of both taste and nutrition, according to the Culinary Institute of America. If too much baking soda is used, the beans can taste of soap, so measure carefully. Baking soda also damages thiamine, a B complex vitamin. With a tight food budget, using older beans by tenderizing them with baking soda may seem better, even with some nutritional loss, than taking a complete loss by discarding them. Fortunately, baking soda isn't the only option for older beans. Instead of adding baking soda to the beans, try boiling then freezing them. Freezing followed by thawing breaks down the cell walls, softening the texture. Combine the beans and water in a pot at a ratio of 10 cups of water to every pound of beans. Set to soak overnight. If pressed for time, try a quick soak. Bring the beans and water to a rolling boil. Boil 2 minutes. Cover and soak for 1 hour. After soaking, simmer beans for, depending on bean variety, 45 minutes to 2 hours. After the beans cool, they're ready to freeze. Thaw them when needed. Cooking beans damaged by age or storage in a pressure cooker can also work, though you may have to increase cooking time. Occasionally, beans get too hard to cook. These, grind into bean flour. What Can You Do if You Forget to Soak Kidney Beans Overnight?